Location: Charmes-sur-l'Herbasse, in the Drôme departement of France (Rhone-Alpes Region). Notes: Château de Charmes-sur-l'Herbasse is located in Charmes-sur-l'Herbasse in the Drôme department in France. It is a typical position of feudal buildings, overlooking the valley Herbasse to ensure surveillance and defense. It was built in the eleventh century on the site, supposedly, a wooden tower and a speaker built in the tenth century. With walls that were nearly three meters thick at the base and which sink six meters into the ground, it can defy the centuries longer. This castle is in the form of a quadrilateral accompanied by two towers and two pepper shakers, the dungeon (where you can not access that as at 2 second floor, the ground floor and the first one was sentenced for an unknown reason) . is contiguous to the north facade. Underground collapsed, which connected the castle to Champos were probably built in the fourteenth century. There was relatively little change to its general appearance. The most significant changes concern the openings and roofs. Visitors can see on the south facade traces of a door and a window height of the first floor below the coat of arms carved in low relief Nerpol. The arms, still well preserved, are very readable. 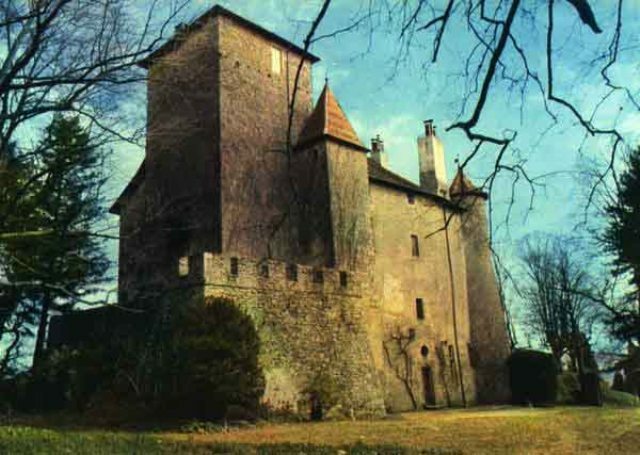 In the Renaissance, the work began to transform what was a small castle into a pleasant Renaissance mansion. Old openings were walled, large mullioned windows were pierced and doors on the ground floor were created. An interior was undertaken, the allocation of floor levels was modified. In the seventeenth century, the castle is furnished, including classical style marble fireplaces are installed in parts of the first and second floor. In the great hall of the first floor, one can see a beautiful carved fireplace in the Mannerist taste. At the same time, a gray backdrop is painted in the small chapel on the second floor. The wooden altarpiece that had been created for the oratory, is now in the Museum of Sacred Art of Mours St. Eusebius and table depicting St. Sebastian, specially painted for the oratory of the castle is now in the church Charmes.In the eighteenth century, ponds are dug. They are powered and the romantic style of cave through an entire collection system and channeling water from a source located at 6 kilometer upstream in the direction of Saint-Mury. In the nineteenth century, the neo-Gothic style will be reflected in the North walls adorned with gargoyles. At the end of the twentieth century, the roofs of towers and tower were restored and the largest inland part of the castle has been restored. Outside, the ponds were restored and the park has undergone improvements: planting boxwood and old roses. It is registered in the inventory of historical monuments since 1986. This important monument of our heritage today is a private estate.